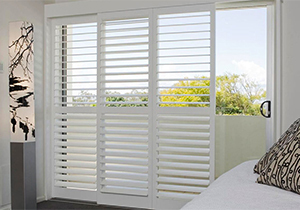 Clearview are a new concept in plantation shutter design. The new design allows us to remove the tilt bar from the front of the shutter necessary in Traditional Plantation Shutters allowing a much improved view and easier cleaning. 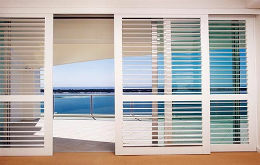 Clearview shutters have a concealed tilt bar which is positioned on the reverse side on the edge of the louvre. 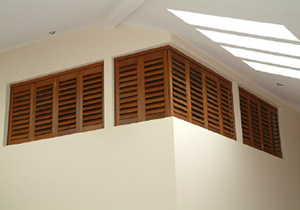 The shutters are made from a man-made material known as ABS (Acrolonytrile Butadene Styrene). 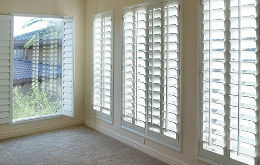 Your shutters will keep looking their best in any climate condition. The shutters are tested for high temperature to ensure your investment is well protected even in the most extreme temperatures. ABS’s remarkable durability comes from incorporating the same advanced materials found in automobile parts, building materials and other punishing applications, formulated especially for strength. The shutters remain amazingly lightweight and beautiful. The key to their enduring beauty is in their construction; heavy-duty structural joints create a sturdy frame, built with the same precision and craftsmanship as fine furniture. Aluminium inserts are used for increased strength and stiffness. The shutters are energy efficient 70% better insulated than timber shutters. They are low maintenance easy to clean and Hypoallergenic. 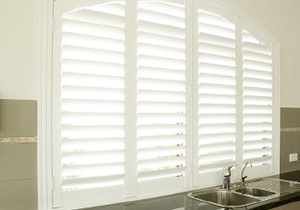 The shutters are protected by a high UV inhibitor to ensure lifetime durability. 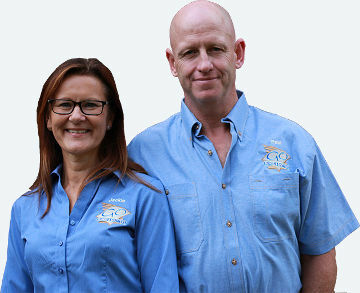 They will not absorb moisture and are suitable for all areas of the home including wet areas. The shutters are all Fire Retardant NFPA 701 certified. The shutters come with a twenty (20) year warranty. We have a full range of colours available for shutters in our Gold Coast and Brisbane supply warehouse, so you can choose the right shade to suit your home. Our internal shutters are made using predominantly 89mm aero foil blades although 63mm and 150mm are available. Hinged shutters fit within a frame either within or outside the window reveal. A "D" mold is added to the meeting panels to reduce light ingress into the room. Shaped panes are designed to cover architecturally or special shaped windows or openings. These special shapes can be made from a variety of colours. 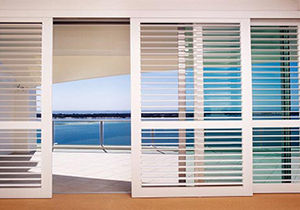 If you are looking for stylish, attractive shutters on the Gold Coast or Brisbane, we are the people to talk to. Our sliding doors are mounted onto tracks which are concealed by a pelmet. Side panels and light bead can be fitted to prevent light ingress into the room. Bifold shutters are a great way to cover an opening or window while providing you with the opportunity to open them fully to one side or evenly to equal sides. These are a great choice for many Gold Coast and Brisbane properties that have feature windows overlooking world-class views. 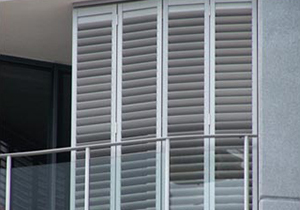 Our external aluminium shutters are 100% Australian made from the raw materials to the finished panel. Applications are wide and varied with a strong emphasis on balcony enclosures. The 90mm louvre blade has been specially designed and engineered to cope with all types of weather conditions and have been tested for noise, wind and resistance to wind pressure for cyclone regions. 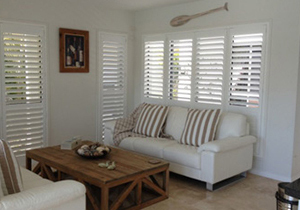 The shutters are cyclone tested and certified to withstand Category 3 cyclone conditions. The cyclone rated shutters are best suited to water-front properties and any application where they encounter strong to severe winds. The frame along with all the other aluminium extrusions is manufacturered from 6063 grade and tempered to T5 as per the Australian standard AS2612:1997. All assembly fixing screws and components are manufactured from stainless steel. All plastic components are glass re-enforced and are protected by UV inhibitors. The louvre blades and unique pivot system have a 100g load rating at a span of 1 metre. All powder coating on our aluminium product is applied to a minimum of 60 microns and complies with the Australian Standard AS1213:2002. The powder coating shutters comes with a ten (10) year warranty. Our cyclone shutters have a Category 3 cyclone rating tested by the Adelaide University Departments of Civil and Environmental Engineering. Blade locks can also be added to your shutters for additional security.